In heart of Levi holiday centre. Wood and stone-built holiday apartment on one level on the ground floor, built in 2004, living room/kitchen 2 x single separate beds (80 x 200 cm), convertible sofa as an extra bed, sauna and washroom. No fireplace. Apartment equipment includes hair dryer, cable TV, coffee maker, electric kettle, toaster and clothes ironing equipment. Ski care room at one end of house. Apartment has own lockable storage facility. Warm garage place for a car (located in the building next to this apartment). Final cleaning and linen (sheets and towels) are included in bookings made after 30.5.2018 (bookings made before above date: only final cleaning is included, linen for extra price). 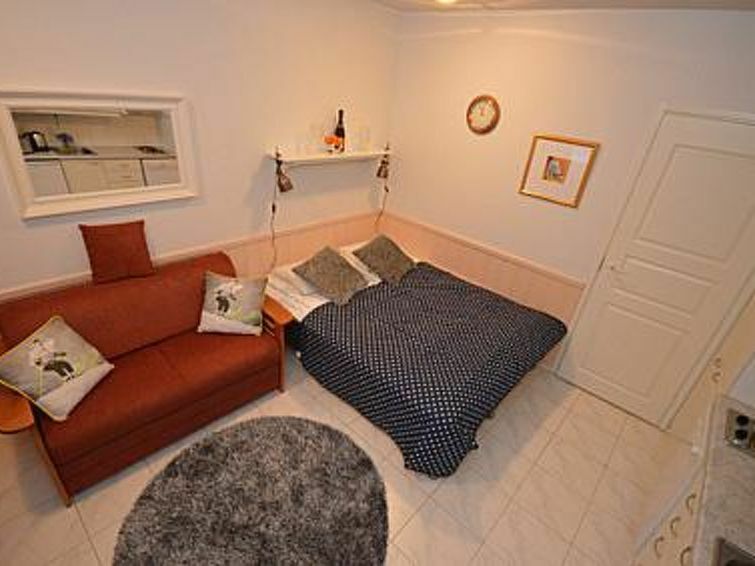 Pretty, refurnished and redecorated small apartment in Levi Centre area. All services within walking distance. For example, restaurants 300 - 600 m, spa 650 m, ski slope 650 m, golf course 4 km. Note! The LeviStar108 apartment suite does not exist, there are 1108. This discovery cost me an hour of searches. But everything else was excellent.